These are more things that are in the “Life in Butte La Rose” category. A big spider seems to always get your attention. Even if you don’t care much if small ones run across your sandaled and sockless foot, big ones will usually cause an avoidance reaction by us humans. The lady in the picture is about four inches toe tip to tip. Most of us have a memory of walking through the woods (or just the yard) when we were young and suddenly having a big sticky web plastered across our face. You try to pull it off and it sticks to your hands, and your glasses, and your hair. If you happen to be interested in nature you will probably know what spider made that huge gluey web, and then you will worry less about getting the web off than finding the very large spider that made it. If you are alone, you cannot see if it is walking along your back near your shoulder blades, coming closer to your neck. And you wonder if it is irritated by your total destruction of its home and food-gathering device. Or maybe it is on top of your hat riding along contemplating its next move. You wonder where the middle of the web was because that may be where the spider was prior to impact. Is that the middle of the web on your chest ? And who told you that wearing loose clothing was a good idea?! If you feel it crawling along your stomach inside your shirt, do you dare hit it and thereby almost surely surpass whatever tolerance it has left for your violent activities? I wouldn’t hit it, but that shirt would come off the quickest possible way! But we may rest easy, this spider, the banana spider, does not seem to be aggressive, at least not the ones I know. Encounters like this, however, may explain why a lot of people do not like to be outdoors these days of video games and football games and Internet action. Those indoor things don’t jump on you. 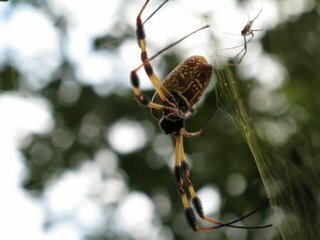 The big female banana spider in the picture (and her tiny male cohabiter) is resident in our yard. I run into them often on the lawn mower, but so far they don’t mind if I live here too, and next morning there is a new web for me to blunder into. Then there is the cow killer. 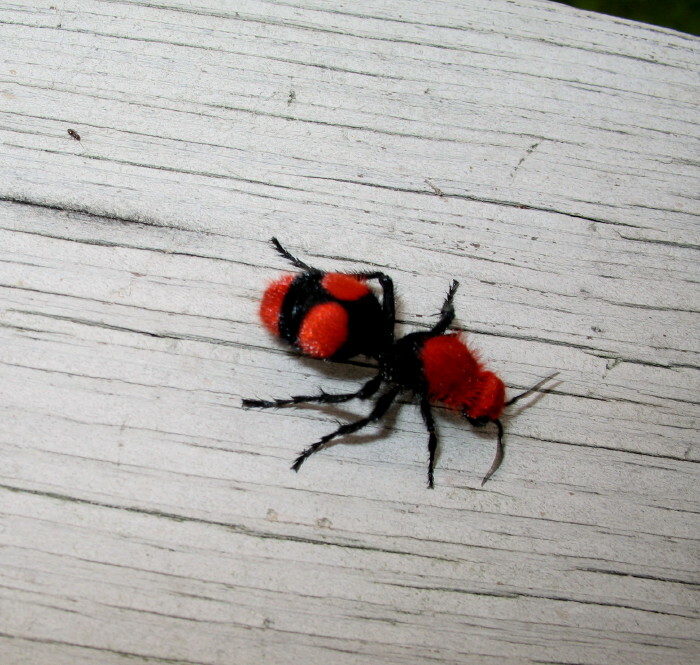 This is the name given by folks in the eastern U.S to the one-inch long velvet ant. 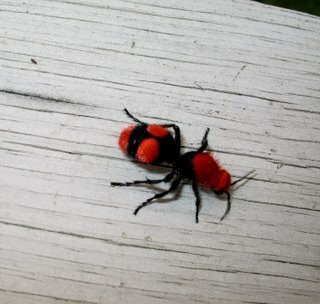 For those who don’t know, this insect is actually a wingless species of wasp. We called them red ants when I was growing up, well before the invasion of fire ants – now sometimes called red ants by some people. But the cow killer is a fearsome animal best left alone. It has a very large sting, and a very, very painful venom. If you pin it down with a twig, it eeennnkks at you, loudly. It is not a good idea to try this. As a boy I would try to kill these wasps by stepping on them (with shoes on) and it was impossible to damage them if they were on a soft surface like the ground. If you had soft-soled shoes it was even hard to kill them on concrete. They are unbelievably tough. The one pictured here is r unning at a good clip along the hand rail of the walkway to the river. Normally, I would try to stop the action long enough to take a good picture, but not this time and not this animal. That’s why the picture is a little unfocused. 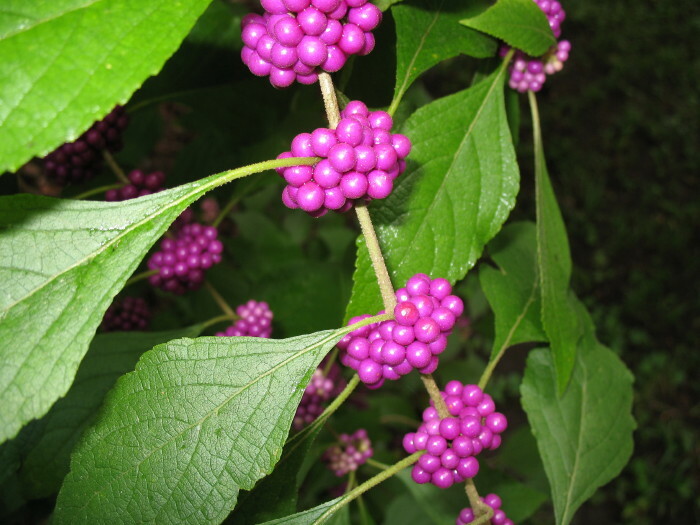 Most southern gardners are familiar with the American beautyberry, or French mulberry. 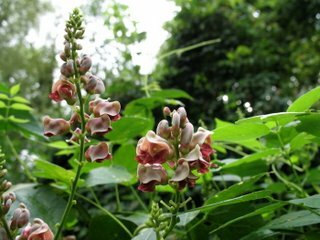 It is a native plant that has considerable wildlife value. Several kinds of birds combine to clean every fruit from our plants every year. The purple variety seems to be the more common one in local gardens, but thanks to Bill Fontenot, we have a white-fruited variety. 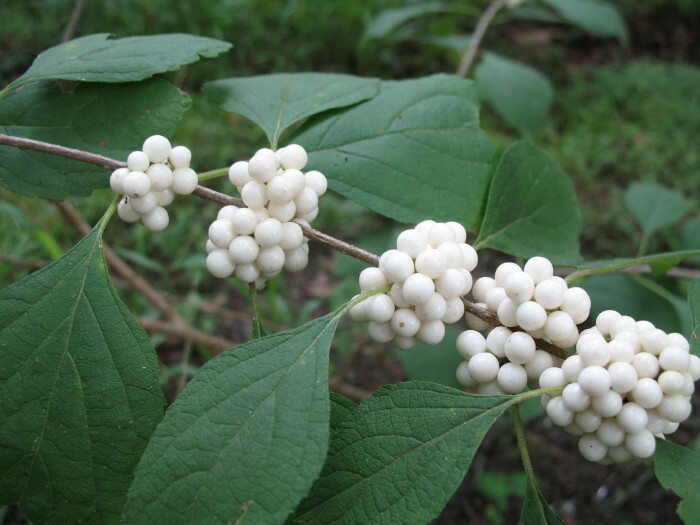 The plant is not as vigorous as the purple one, but this year the rain seems to have encouraged a nice display of white fruit, worthy of a picture. I have had a lot of trouble taking good pictures of very white things. The desired image is usually indistinct and overexposed. Th is time the pictures are worth sharing, I think. 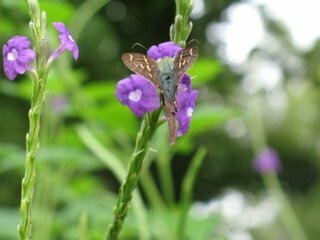 A couple postings ago, I showed a picture of a silver-spotted skipper, today I found its other common cousin – the long tailed skipper. 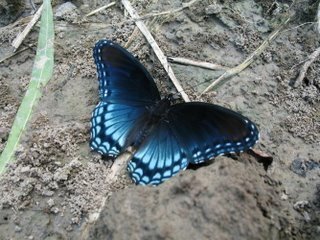 The iridescent blue on its back wasn’t seen until the images were put on the computer. Lastly, the pea-like flowers of this vine are pretty, but man is this plant a big problem. It is our version of kudzu. It covers everything. I heard some talk about it last summer but it wasn’t very noticeable here at that time. Well, now it is a pest, unless you like to think of your whole yard as being just a substrate for this vine to climb on. But admit it, the flowers are pretty. The river is at 1.8 feet on the Butte La Rose gauge, falling to 1.5 by Wednesday. That’s low, my friend. The Ohio and Mississippi are both falling all the way up. Looks like this week may be the week to go out and survey the sunken boats near Flat Lake. Sunset yesterday evening was nice all around. This picture is facing east, not west. Sometimes that just happens. Yesterday afternoon my friend and son-in-law Danny and I walked down to the river to look around. It was hot, but there was an easterly breeze blowing up the river all day. It almost took the heart out of the heat. Danny likes to fish a lot, and we soon had rods and reels fishing with river shrimp out in the water. I wasn’t very enthusiastic, particularly since most of the fish that had been biting lately were short-nosed gars. They nibble and nibble and then you set the hook and they go crazy for a few seconds and then they get off, usually breaking the line. Setting the hook in a garfish’s mouth is like trying to hook a piece of ceramic tile, it’s almost impossible. So, the gars started to do their thing again and I got tired of it and started to just ease the line up instead of jerking to set the hook, not caring if I caught them or not. The first time I tried this nothing happened, but the second time there was a continuing weight and some active resistance on the end of the line. I slowly brought up the line and began to think there may be something worth catching on the other end. Sure enough, a big crab came to the surface and Danny “grabbed the net” and brought it in. 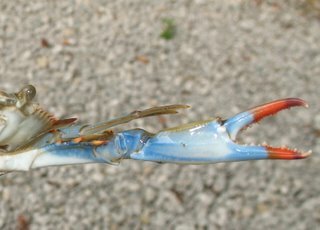 Well, a few days ago I posted the first blue crab to appear in a shrimp trap in four years, and now here was a big one. Might there be more? Now we had to catch something to bait crablines with, so back to fishing for real. Danny soon caught a catfish and we cut it up for bait for two lines. We tied weights to the bait and set the lines on the bottom and got the net ready – a sure way to hex yourself. While waiting we began catching more crabs on the rods. 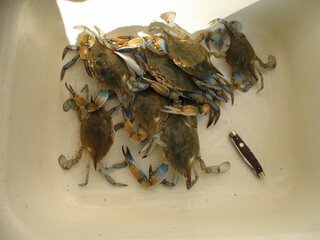 We ended with nine nice crabs, all caught on the rods, none on the crablines, though the turtles liked the crablines a lot. Never get the net ready before there is something to catch with it. We caught a gar and cut it up (with a hacksaw) and baited a regular crabtrap like they use in the bays. I checked it this morning – nothing. Go figure. But we ate the crabs for supper last night, and were they good! I believe these freshwater-caught crabs are the sweetest tasting ones there are. As I said, this is the first time in four years the crabs have come up this far in the river. It is good to see, and eat. The gator story isn’t over quite yet. I managed to get the skull and jaw up out of the mud last week. That animal really was bigger than I thought. His head (and it was a he) is airing on the raft. Every time Napoleon goes down there he is very alert, and very careful and he sneaks up on those bone so full of teeth. He sniffs the air and moves his head from side to side. It is obvious that something about the bones still signals danger to the cat, even though they are so obviously dead. A couple days ago, the water dropped an additional six inches due to a low tide (yes, even up here), and I could reach the place on the bottom in the mud where the gator sank and decomposed. There is nothing left now but the bones, which are clean and really have very little odor. I could lean down from the boat and feel for solid objects in the mud. Right away I began to bring up handfuls of the plates that form the base for the squares of skin on the back. This is one of the most diagnostic bones to be found as gator remains. Nothing else has them and nothing else looks like that. (so where is the picture? I’ll add one later). Soon, other gator parts came up – vertebrae, ribs and shoulder blades, and other stuff. Other stuff? Yes, bones that didn’t belong to the alligator. I was looking at turtle shell, broken turtle shell. Could that be the gator’s last meal? If so, how would he have swallowed it? It would have to have been broken up, and there might be tooth marks in the shell. And there were. Th ere, plainly, the story told itself. The turtle had been about ten inches long and was now in about twenty pieces, some clearly showing the tooth damage. How neat! More feeling around in the mud. Another type of bone, not turtle, a vertebra of some kind. Another vertebra. And then a piece of bone from something’s leg, and another piece from something else’s leg. There were the remains from at least three species of animals in the alligator’s stomach when it died. This is particularly fun for me because I really like the puzzle of identifying animals by the bones you find sometimes, especially in Native American trash dumps (kitchen middens). Here was a good puzzle. So I brought the bones inside and began to look for identifications. My wife Carolyn is a saint, that’s all I can say. 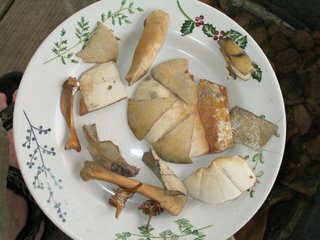 The items in the plate are the bones we are talking about. The first thing I could identify was the tibia (lower leg bone) from an adult armadillo. And then the two vertebrae turned out to also be from an armadillo, lumbar vertebrae to be specific. Probably the same armadillo. 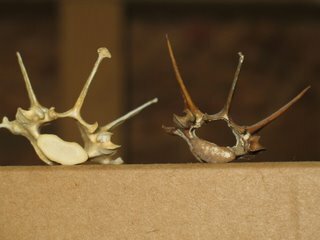 The picture compares the dark brown vertebra with the same bone from a reference collection that I use, they are identical. The last bone was the most difficult because it had been rounded over by the digestive juices. But the best I can come up with is the femur of a canid of some kind, probably dog – domestic or not I don’t know. So, that makes three species we know the gator ate, and these not too long ago: redear slider turtle, armadillo and dog. No wonder Napoleon is taking no chances with that skull, whether it’s still connected to the rest of the alligator or not. The yellow big-eyed thing is a male io moth. Kind of looks funny: just “io”. 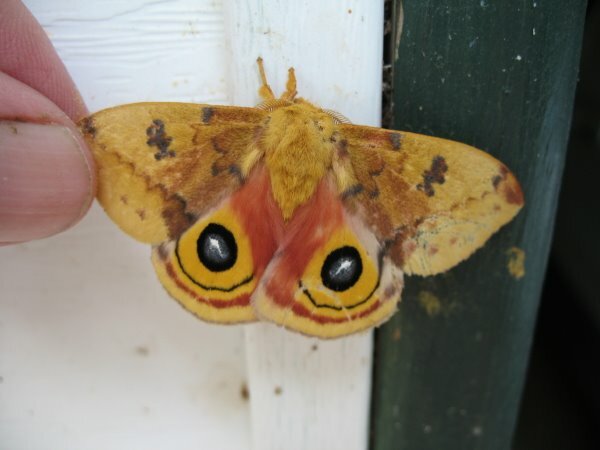 These moths come to a mercury vapor lamp we have for security. They seem sort of torpid during the day and are pretty easy to photograph. 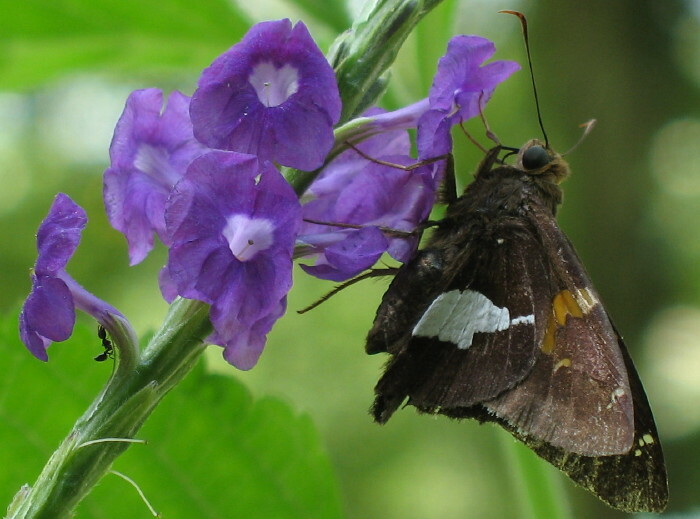 The other picture is a silver-spotted skipper. What I like about this picture is the ant in the lower left corner. I didn’t see it until I saw t he picture on the computer – serendipity for sure. These are just two more items in the picture album I call “Life at Butte La Rose”. Dave Patton and I saw a blue racer today that I couldn’t keep up with, so no picture. The river is at 2.3 on the Butte La Rose gauge, and will stay about there for the next several days. The Ohio and Mississippi aren’t doing anything dramatic either. I was telling this pretty long story the other day and someone suggested that writing it down would be a good idea. Now that I think about it, I think so too, especially since my friend from Eunice, Willard David, pulled up to the dock this morning to visit for a few minutes. 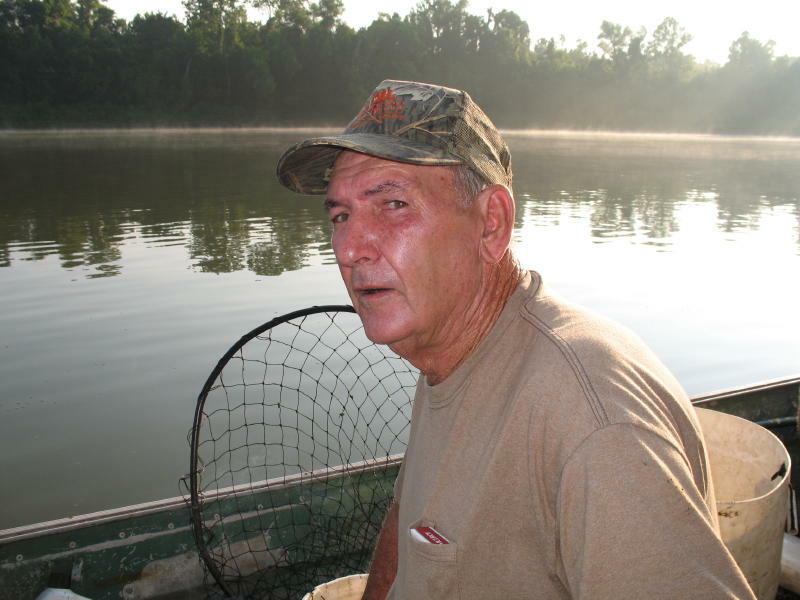 He had just set out some juglines that they use to catch big catfish. He often stops when he sees me down at the dock when they pass. He has a part in this story, and is pictured as he looked this morning. In 2001, knowing that I was going to transition (retire sounds sort of final) out of state agency work within a few years, I needed to find a boat that would be my go anywhere do almost anything boat for the years when I would have time to do almost anything and go almost anywhere. One forgets that decreased physical capacity often accompanies the increased time available, at least one forgets until one tries to act like a young man instead of an old bureaucrat. But that’s not part of this story. I looked for the right boat for several years and finally found the one that met the standards I was looking for. 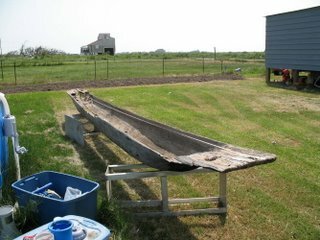 I wanted an aluminum crawfish skiff that was about 17 feet long, four feet wide at the bottom and it had to have a safe curve at the bow. This last was because many times these aluminum skiffs have been the cause of drownings due to design problems. This happens because under certain conditions the bow of these skiffs has a way of diving under the water instead of riding up over it, and throwing the people out of the boat, and then the boat sinks right away. I have had five friends die like this over the last 30 years, in four different accidents, and there have been enough close calls for the survivors to make this information common knowledge among fishermen. But the boats are so useful, and so popular, that most people don’t consider them dangerous, at least not so they admit it. So, for this reason I wanted to make sure the bow of this boat would not do this diving action, and that’s why it took so long to find the right boat. 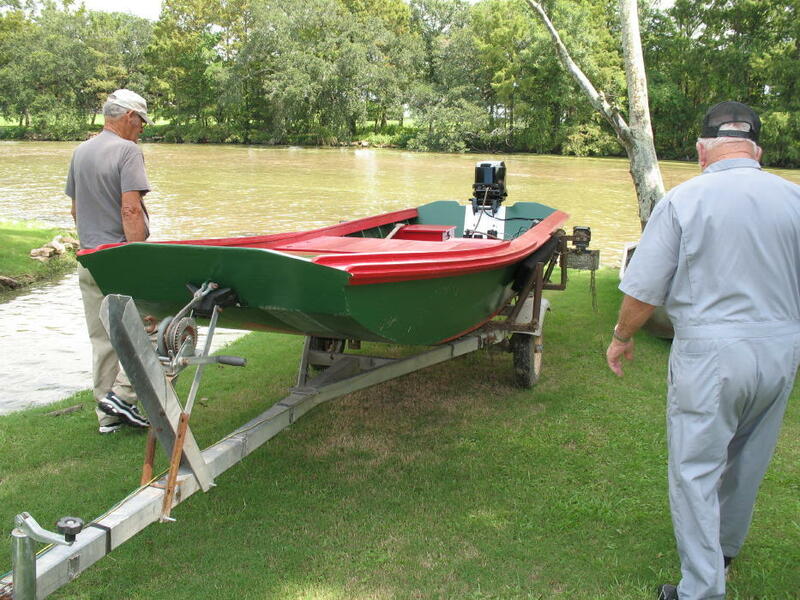 But we did, in the fall of 2001 I found the boat for sale, in Charenton, along the levee. Not entirely trusting my judgment, I took the boat to two very experienced commercial fishermen, both of whom used these skiffs, and they both pronounced the boat suitable for my intended needs. I won’t say they said it was safe, just as safe as any others like it. Several modifications were made, a second bottom, mainly, and a full dry box across the back for a seat. Once all this was done, I bought a new Yamaha 50 horse motor, manual control, but with a hydraulic lift (in reluctant acknowledgment of looming retirement age), installed it, and bought a new trailer for the boat. 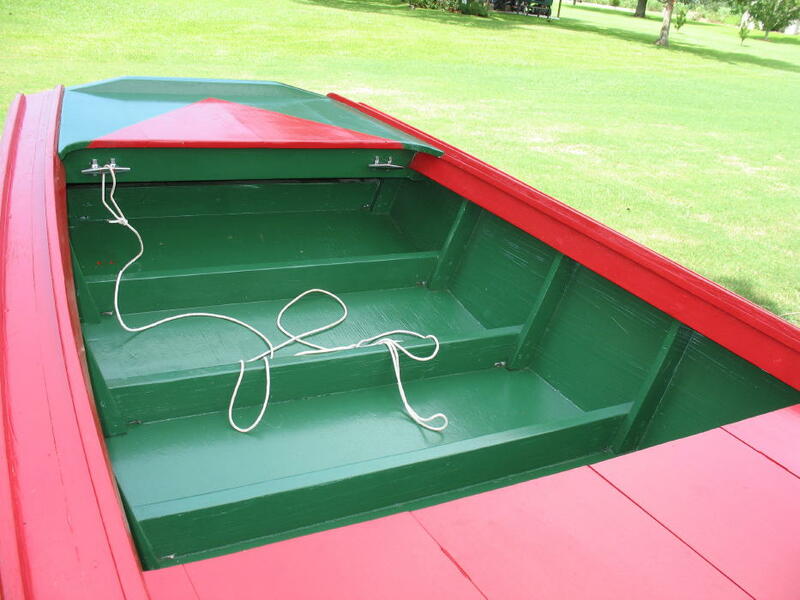 For a finishing touch I put in cypress bulkheads and hatch covers, and the boat was ready. On its maiden voyage Carolyn and I took it to the Butte La Rose Canal and spent a wonderful picnic afternoon watching the sunset and enjoying the boat. 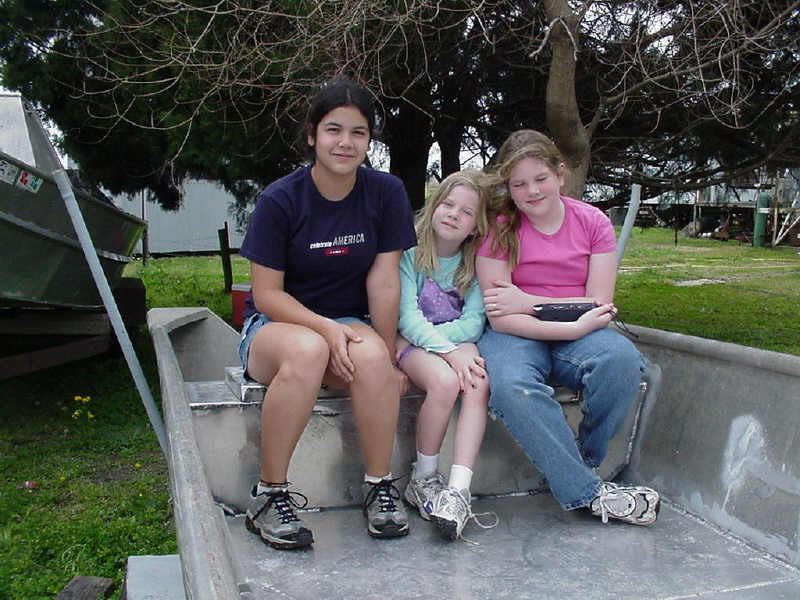 [The picture is of Ashley, Kayla and Danielle in the new crawfish skiff.] 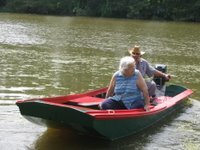 A few days later, we experienced the annual Camp Delahoussaye, being a week of letting the grandchildren come and see what it’s like to live in the country, along a big river in a big forest. The idea for this is that by exposing these young children to a few days of heat, mosquitoes, smelly fish and the other wonders of being outdoors in Louisiana in the summer, we could counteract the other 51 weeks of playing video games in air conditioned living rooms. Ha. Right. But, we try, or actually, mostly Carolyn tries. I’m too easily defeated by the ennui common in urban grandchildren. At best, I’m a willing boat driver and trotline runner. But here we are at the 2002 grandchild indoctrination session, and I have a brand new boat to show off. 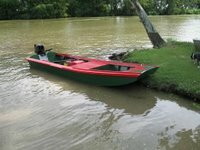 So on June 29 we put the boat into the water in the Atchafalaya River and pulled up to load the boat at the floating dock we have behind our house. There were four children and Carolyn and me: Lauren (a niece) 15, Kayla 7, Danielle 9 and Ashley 15. Lauren, the niece, is from Houston, a pretty sophisticated young lady, and early on she informed us that “I don’t do mud”. The rest of the ladies are grandchildren and are from Houston and Austin and were unannounced as to doing mud. 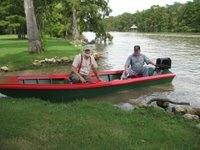 We were on the verge of leaving the dock for a ride up the river in the new boat, when Willard, the friend from Eunice, came up the river and stopped alongside for a chat. He makes quite an impression, an older gentleman in blue jeans and an old T-shirt, bare footed, bare headed and usually smoking a cigarette. And as friendly as he can be. His feet look like they would be comfortable walking on almost anything. He looked over into my boat and saw that the young ladies were all sitting on their lifejackets as I had asked them to, except for Kayla who was required to wear hers. Carolyn and I were sitting on ours too. You can’t be too careful. But Willard said, to the kids, “Why don’t yall make an old man happy and put on those life preservers?”. The four of them looked at me and I nodded for them to do it, it just seemed the friendly thing to do, since he had asked. Shortly after, he said goodbye and left to go run his lines. We settled into the boat, two in the front, two on the hatchcovers, and two of us back on the seat near the motor. For the life of me I can’t remember who was sitting where, but I’ll bet they do. Anyway, off we go up the river at about 30 mph, which was about 2/3 throttle for the motor. We crossed under the I10 bridge and continued up the river about a mile, passing occasional camps on the left bank as you go up. After about a mile, I turned around and started back down in the middle of the river. It was getting late (7:30). I never saw what we hit. Very suddenly the motor hit something solid and jerked the handle hard to the left. What happened next was so quick that it was almost like no time passed between the time I felt the motor jerk and then found myself underneath the overturned, and sinking, boat – no memory of it overturning, just dry one moment and wet the next. I came up in an air pocket and could see a light area under me. I guess you must instinctively reach for light because I did and felt the side of the boat and pushed myself under the side and reached the outside of the boat, and the surface. At that point it was still hard to absorb what had happened, but looking around I could see Carolyn holding onto a life jacket, Ashley and Danielle and Lauren were floating in theirs. But no Kayla. Carolyn started yelling for Kayla, and she got about two yells out when Kayla popped up right beside us, also floating in her vest. She was crying that she had lost her shoes, which we didn’t take too seriously, and oddly enough we soon found she hadn’t lost them at all. Taking stock of injuries, we had a couple scrapes, and a few very evident bruises, but no one was seriously injured. Four of us had been thrown clear of the boat and two had been caught underneath – me and Kayla. She tells the same story as I do, she saw light and crawled out from under the boat – not bad for a seven year old. 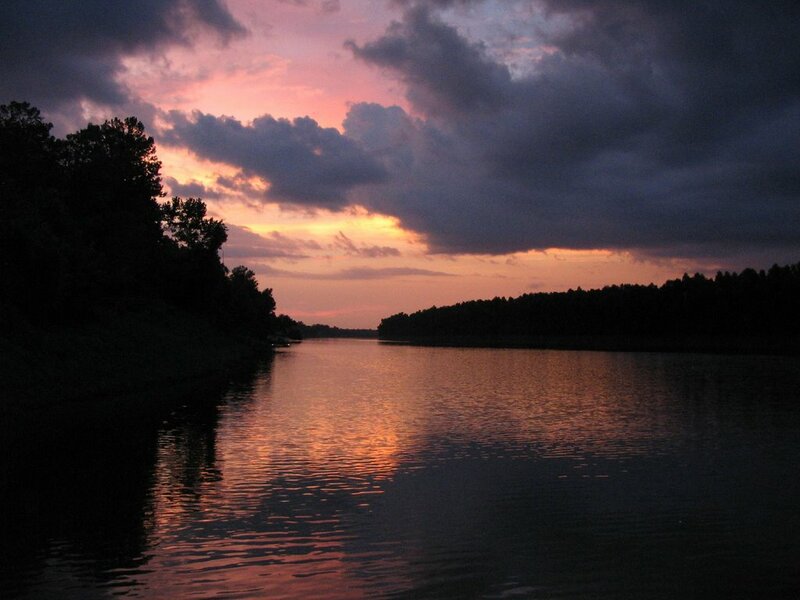 But, here we are floating down the middle of the Atchafalaya River. The point of the bow has now floated back to the surface, being held up by an air pocket, the motor straight down 16 feet toward the bottom, which is about 35 feet below us. For some reason I’m trying to keep the boat from sinking by holding the bow line. Ashley calls to me “Pop Pop, don’t you want to tie something on the rope?” Oh, yeah, a marker to locate the boat when it sinks, yeah Ashley. Good thinking, where is my brain? She swims to a passing plastic milk jug and throws it to me. I tie it onto the 30-foot bow rope and look around for what to do next. Carolyn has now gathered the chickens and is starting to swim to the wrong bank. I ask her to turn and swim to the right descending bank since that’s where people have camps. Aha, she sees the point and turns, as do the chickens. The accident has been seen by some people out for a quiet Sunday afternoon at the camp. We saw them sitting in their lawn chairs and barbecue pits on the way up the river, and we waved to them and they waved back, beverage in hand. Now they are trying to keep up with us by running along the bank as we float down with the very considerable current. Problem is, there is not a continuous clean bank; there is a camp with a clean lot, and then a forested lot or two, and then another clean one. So they have to follow the bank and then go up to the road and then back to the river to see where we are. And so on, bless their hearts. After about what I’m guessing was about a half mile, we managed to get close enough to shore to try for a place to climb out. As we edged closer, Danielle yells out “Pop Pop, an alligator!” And of course, there was one, it was sunning on the bank right where we were going to reach the shoreline. It wasn’t that big, about six feet, and I told Danielle, who had stopped swimming toward the bank, to keep swimming because the alligator wasn’t our biggest problem at the moment. Trooper that she is, she did. And the alligator took one look at six determined humans coming for it with unknown intentions and it hit the water with a splash and we never saw it again. So we got to the bank and just kind of sat there in the mud for a moment. The river bank at this place is pretty steep, about a 35 degree slope about 40 feet to the top. In our condition this was a pretty good climb. But, the campers to the rescue! Right after we reached land, people showed up at the top of the bank and were looking down at us. One man yelled something like “Wait…. !” and jumped down the bank and his momentum was considerable from the start. So considerable that he couldn’t stay upright coming down the bank and he lost his footing and tumbled all the way down and past us and hit the water a good ten feet out in the river. At which point his wife is screaming at us from above “Help him! Help him! He can’t swim!! !” We helped him back to the shoreline, and it became evident that he was one of the ones hoisting beverages earlier. He was very drunk. We saw that he was OK, and we all started to climb the muddy wet slope. Problem was, we were pooped. You had to crawl up the bank, and Carolyn got about ten feet and got stuck even though she was on hands and knees. Behind her was the drunk guy, and I was a few feet away slightly ahead. Picture Carolyn immobile on all fours and behind her is the drunk guy and he realizes she needs help of some kind to get up the bank. The part that is available for him to push isn’t usually the part you touch on a woman you just met. But he looks at her, and looks at his hand, and back at her, and you can see him reach a decision. He reaches forward and pushes – hard. She goes up the bank about four feet. She doesn’t even question how it happened, she turns toward him and says “Do it again!!”. And he does, all the way to the top of the bank. The girls and I manage to get to the top also. There is no more mention from Lauren of “I don’t do mud”. She was covered with it, as each of us was. At the top there was a small crowd of people and deputies from the St. Martin Parish Sheriff’s Office and an Acadian Ambulance. They checked us all out and no one needed further treatment, not physically anyway. Someone turned on a garden hose and more or less hosed us off. It was then that I noticed that I still had my Pentax binoculars hanging around my neck, coated with mud and sand. Guess what, they really are waterproof. Pretty remarkable. We got a ride home in someone’s pickup truck. Where do you go to finish a story like this? I guess I’ll just try to include some after-the-fact, but relevant, things. The boat , yes, well, needless to say, we never used it again. After all the precautions I took to make sure the skiff design wouldn’t dive, it did anyway. We salvaged it about a week later using some divers (Ashley’s milk jug was floating as a marker) and a salvage crew from Butte La Rose. I took it to a mechanic in Breaux Bridge and he sold it for me with full disclosure of what had happened. We sold it for the cost of the motor, which had about one hour of running time on it. Wildlife and Fisheries agents visited us that night about 11:00 pm. They do take these things seriously. They filled out a long report form, interviewing everyone, and they took pictures of the life jackets that we used. After about two hours, they finished what they had to do and they gave the girls T-shirts with the logo “We Were Caught Wearing Our Life Jackets” on them. Four years later, those T-shirts are still worn around here. Perhaps the most important thing to mention here is a reminder of the part Willard had to play in all of this. If it had not been for him, I would not have had the girls wear the vests. I would have been legal, and they might have been dead. Weeks later, when I saw him again and told him what had happened, he stopped and looked down in his boat and didn’t say anything for a while. Later I learned that he went home and cried. This is not a man who does this, but he did. These old Cajun men have a heart that is very soft in places. So….. what? Wear life jackets. We do, now, even though something like this will probably never happen again. If it happens to you, you won’t know anything until you are in the water, and those around you are either floating safely, or struggling to stay alive. Wear the jackets. End of soapbox. I bought a very safe Carolina Skiff to replace the crawfish boat. It floats like a barge and will not go through the swamp very easily. But, that’s OK with me. The river is at 2.2 on the Butte La Rose gauge, and it will be up a little next week, to about 3.2 but not for long. The Ohio and Mississippi are up and down in small amounts. I guess that title fits, this being the chapter following the official last chapter in the story of the apprenticeship boatbuilding project. 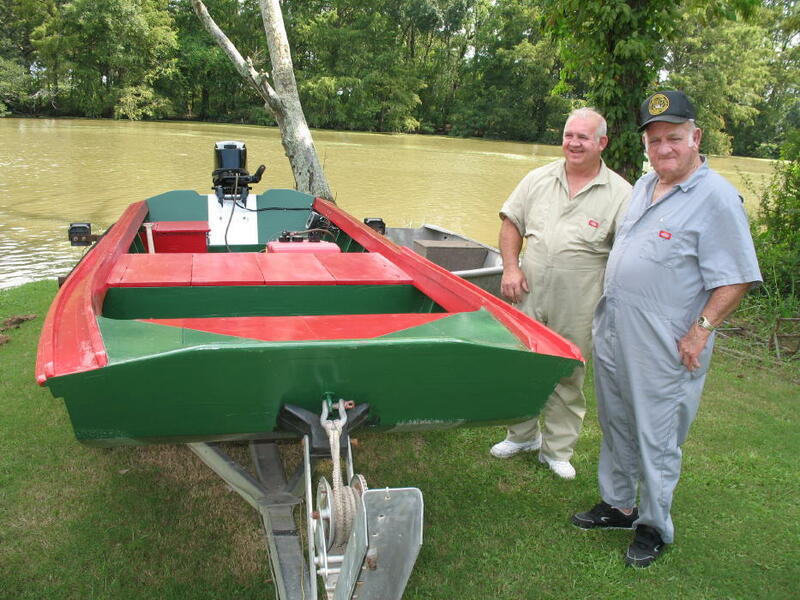 The last official chapter closed the project with the boat being functionally complete – it would float and was ready for a motor and pain t etc. Now the motor has been added and paint has been applied. A number of other things have also been done to the bateau and the included pictures are intended to illustrate that. 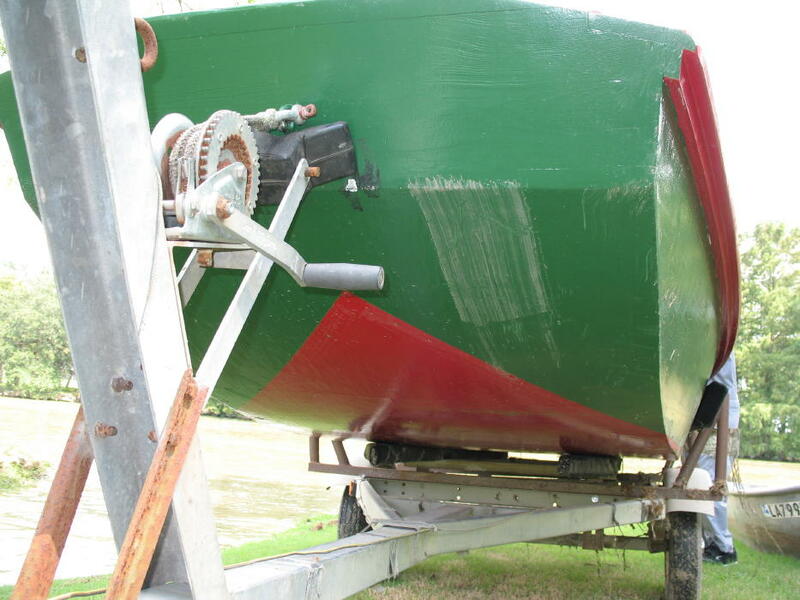 A contrast between the project boat as completed and this final boat can be seen in the first two pictures. First, the paint. 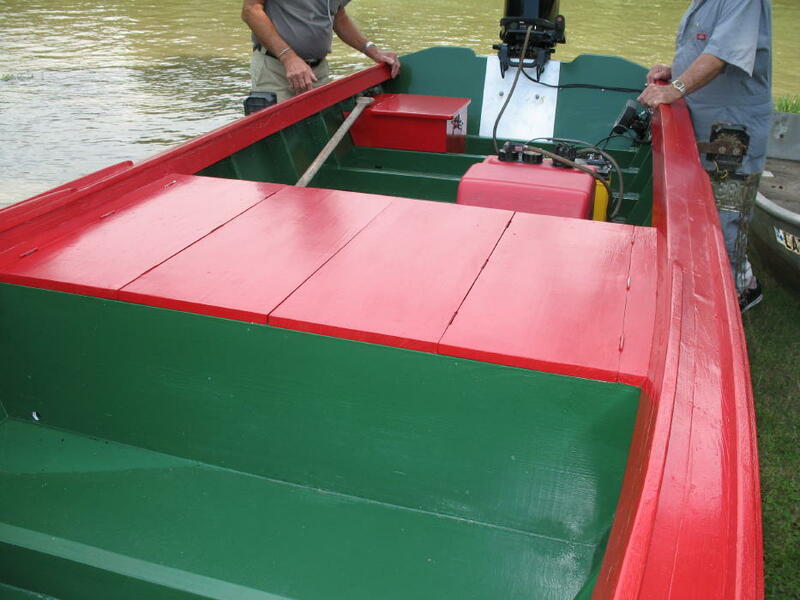 The colors of red and green are traditional colors used to identify boats built by the Couvillier family, and the pattern is also traditional. In the last century, the bottom paint was originally (in the Old Days) red lead, not oil based enamel paint. 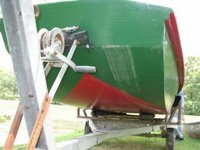 This special paint would protect the bottom of the boat from growth of algae that would slow the boat and make the bottom very hard to clean. Red lead, as the name implies, is made from lead and is no longer considered safe for the environment. 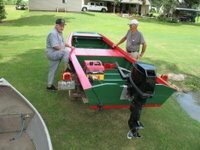 But in this case the red lead paint is no longer necessary because most of the boats these days aren’t left in the water for extended periods – trailers are the more long term storage choice now. 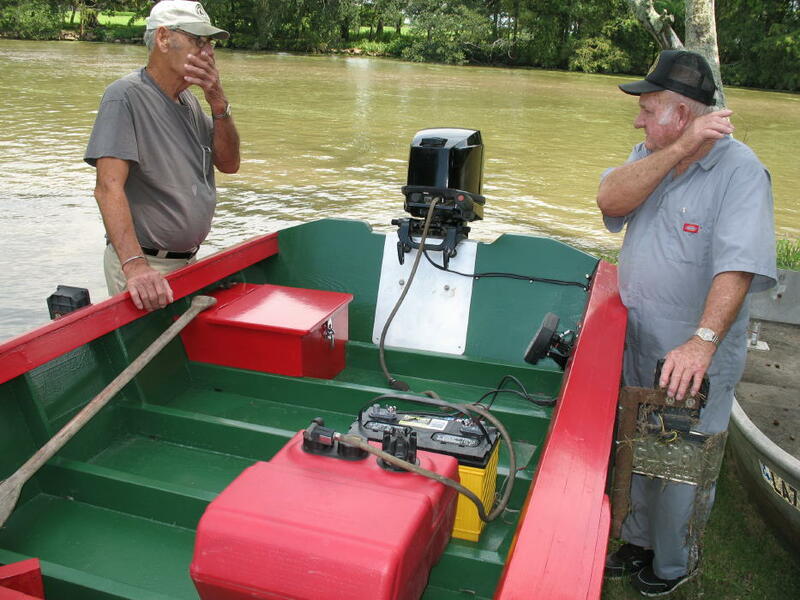 The motor that Larry, apprentice and now owner, has put on the boat is a 25 horsepower Mercury. I would have thought a larger motor would have been more tempting, but when this boat runs with that 25, you don’t wish for anything more powerful – it moves at about 35 mph with two big people in it. This is attributed to the design of the boats that Edward builds. Larry has placed an aluminum plate on the sternboard for the motor to sit on. This protects the wood and ma kes for a secure seat for the motor. Two strips of oak have been added to the top of the gunnels, and one down the side. They run about halfway down the length of the boat. These serve as sacrificial pieces as the boat works as a platform for running hoop nets or trot lines. As they wear away, the small strips can easily be replaced when necessary. 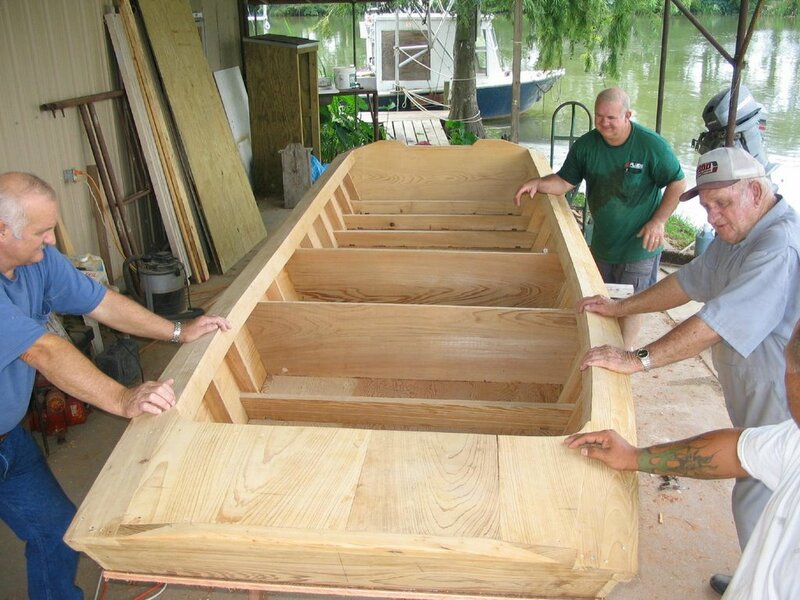 The inside of the bow section shows the area you need to stand in when running lines or doing other work at the front of the boat. The timbers across the bottom are spaced to allow you to stand between them comfortably. 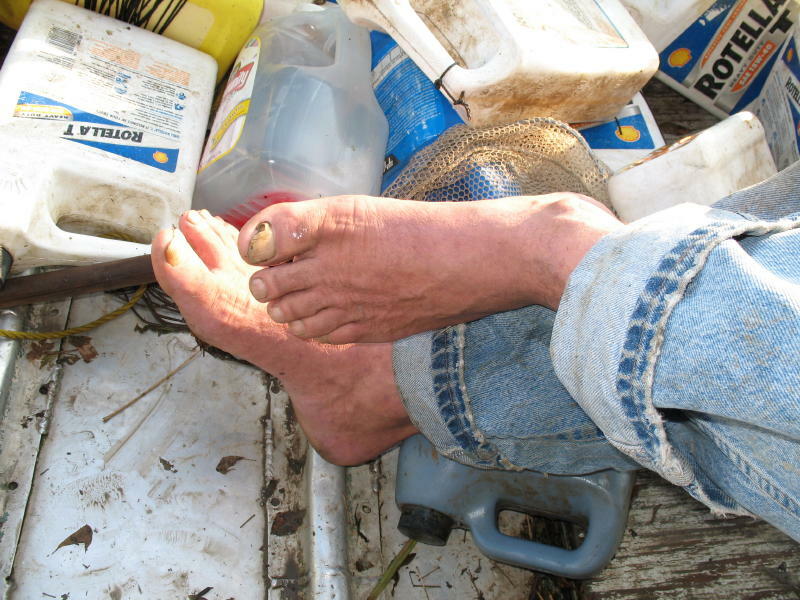 And the deck is the right height to be comfortable for a bait container to be placed there and dipped into 1000+ times a day by a line fisherman. Lots of exercise for the lower back, I guarantee, so it needs to be at the right height. A small seat has been placed in the back for the operator of the motor. It serves as a dry box as well as a seat. Having it small enough to provide room for one person helps maintain room for other work-related material that needs to be stored in the back of the boat. Other occupants in the boat would sit forward on the hatch covers. These bulkhead covers, or hatch covers as they are usually called, protect the fish or other cargo being carried in the boat, and many times they are very useful in getting from the back to the front of the boat, or vice versa. In rough water it’s good to have something that broad to step on. The rougher it is, the narrower the gunnel seems to be if used for a walkway, and it can get slippery. Edward got into the boat and ran it up and down the bayou, and I watched him get that faraway look in his eyes, all kinds of memories going by in front of him, and for the moment passing without a feeling of being over for good. But they are. He will not be able to use this wonderful tool that he has built, as he has done so many times in the past. He knows that he can no longer safely do the work required by a commercial fisherman, but the memories are there as he runs this boat fast down Bayou Teche. 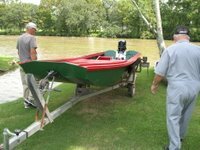 He is using this boat to bring back feelings of big fish, of nights fishing deep lines in the channel, of castnets full of bait-sized shad, of sweating as he drove poles to tie his lines to, and so many, many other good memories. He looks at me and says “Now, if we could just go run some lines”. 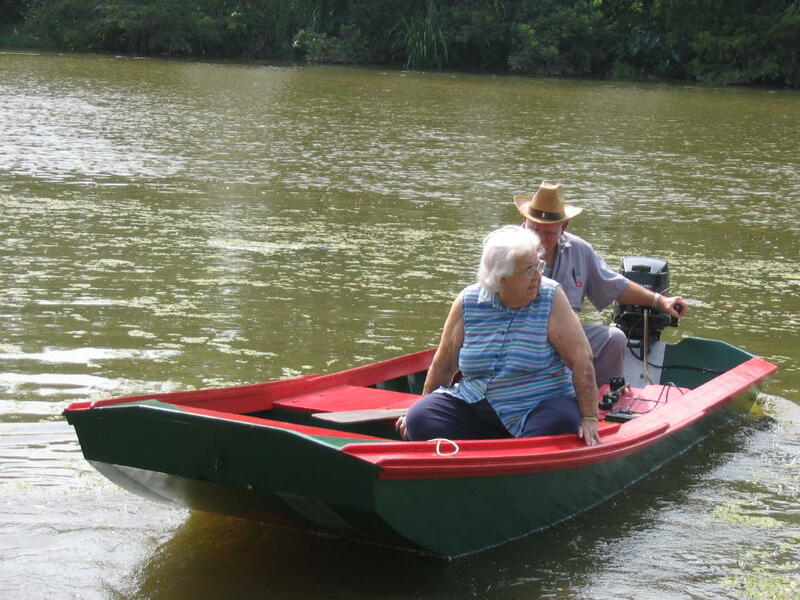 Lena Mae, Edward’s wife, is shown here in one picture riding in the new boat with Edward. She has always helped make a living for her family in ways that used the Atchafalaya Basin. She ran lines with Edward, ran the motor for him when he needed to work in the front of the boat, helped clean fish sometimes and produced and raised a family in addition to all that. If you ask her why she did it she will tell you that she did it because it had to be done, and she will add that she enjoyed most of it. She’s a good cook too! Carl Carline is pictured with Edward in several of the pictures. Carl is another person who can claim to be a Basin native. He has roots in houseboat traditions, and his wife Joyce is from Bayou Chene. Carl is also a boatbuilder at the master craftsman level. 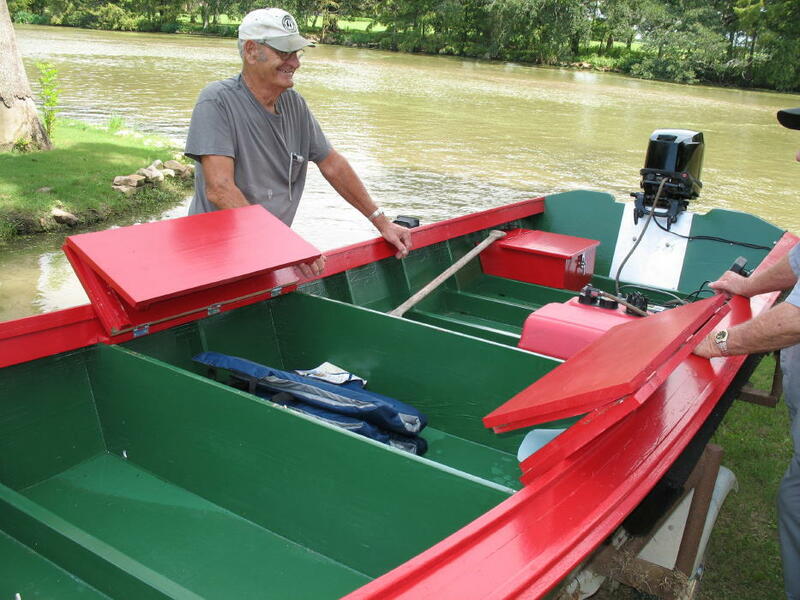 He builds his own boats mostly, both out of cypress that he pulls out of the Basin himself, and out of aluminum. As a practical thing, metal is so much easier to maintain. But the romance and the warmth and the memories are with the wood. 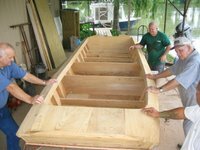 A copy of the full report for the apprenticeship boatbuilding project can be had for the asking. The original was 50 pages long, with 73 pictures and was about 90 Mb in size - way to big to send to anyone. But through the miracle of talented friends, the report is reduced to 1.5 Mb and can be downloaded by most online services. Let me know if anyone would like to have one. The river is at 2.0 on the Butte La Rose gauge, falling to 1.6 by Monday. The Ohio and Mississippi are generally falling slowly. If the river gets to and stays at 1.8 feet for a little while, we may see those old sunken boats yet. 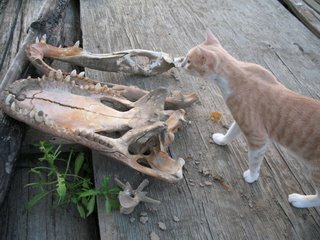 The lowering water allowed me to pull out the skull and jaw of the alligator that disintegrated near the dock. It was bigger than I thought, some teeth are two inches long. Photos to follow when I clean the bones a little. Some of the animals that are passing through the BLR area today are noted in the pictures. 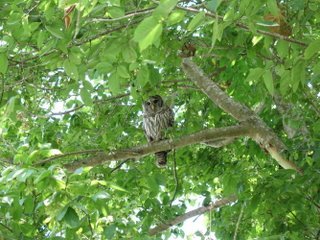 Last night there were at least three barred owls calling back and forth to each other in our front yard, right in front of the front porch. I’m always impressed with how unafraid those birds are of humans. Last night they were doing the “you cook today, I’ll cook tomorrow” thing, and sometimes the “hoo – aah” thing. The latter sounding like some Marines had climbed the trees. This morning I walked down to the river and heard some chickadees scolding something in a tree just off of the walkway. 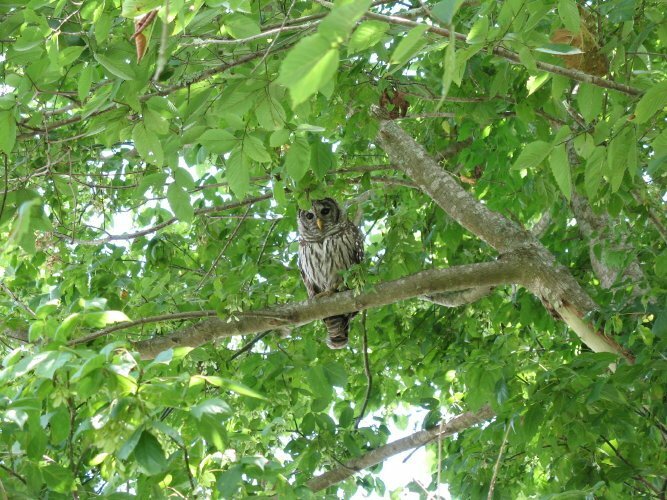 It didn’t take too long to see that it was a barred owl, just sitting on a branch about 30 feet away and looking disinterestedly at me, and sometimes turning and glancing at the scolding birds. How these big birds have survived the Cajun pastime of shoot first and see if you can eat it later, I don’t know. I did shoot this owl, with my new Canon camera. I’m still testing it but it seems to be at least as good as the old camera that I wore out. After the owl, the butterfly was waiting for me down at the river on the muddy bank. And then, in one of the shrimp traps was this young crab, asking to be featured in a blog. The crab is proof that bluepoint crabs are up the river as far as Butte La Rose this year. Some people are fishing them with commercial traps and are doing pretty well I hear. I must admit that I never noticed young male crabs had red-tipped claws, but they do because this one does. I thought it was only the females that had claws like that. Live and learn. The double picture is there and that’s all there is to it, if I try to erase one of them, all the pictures disappear. So, they stay like that. Last Friday my friend Chip asked me to go with him to see an old boat that had been found on Grand Isle. I mean an old boat. Chip is an archaeologist and is guessing that the boat is about 600 years old. It is a dugout canoe made by Native Americans who lived in the marshes along the Gulf Coast. It is about 20 feet long and two feet wide. The story on how these early pre-metal marsh dwellers managed to hollow out a large tree and come up with a boat like this is really something. According to the experts, the Indians used fire to shape the whole boat. They built a fire on the top of the log and when the fire had made char scars deep enough, they scraped the charred wood off with a shell or something, and then built more fires where they needed them. I mean, that was a lot of work! Think about it! This boat is 20 feet long! We really enjoyed the day, and found out that Grand Isle is recovering from the storms, but there are reminders of the damage everywhere you look. The river is at 2.4 feet on the Butte La Rose gauge, rising to 2.8 by Wednesday. 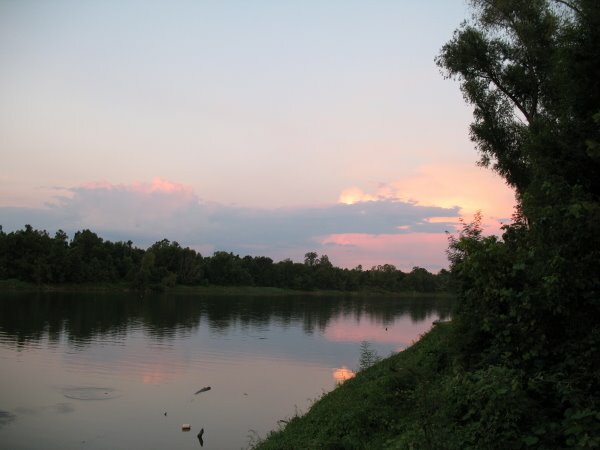 The Ohio and Mississippi are falling pretty hard, and we might see even lower water soon. This would actually be OK because there are some old boats sunk in the Basin that you can’t see unless the water is 1.8 or lower, and we are waiting for that to happen. There have lately been some spectacular sunsets over the river, beginning about July 4. Each time one occurs, I seem to be going to Lafayette over the I10 bridge without my camera. Just as well, Carolyn would yell if I tried to stop and take a picture on the interstate. I did get this one from the dock on the 14th. It's pretty good. Ever notice all the stumps you see along the bank below the Atchafalaya I10 elevated highway when the water is low? You see them clearly at the Ramah end of the bridge on either side but they are really all along under the twin spans of concrete. Whenever I see them, mostly at this time of year, it always makes me wonder what this swamp looked like when all of those thousands of big trees were still standing in these places where mostly willow and swamp maple and Chinese tallow now shade the ground. I like to imagine I10 with the hundred-foot trees around and right next to the highway, and between the lanes. The whole highway would be densely shaded from one end to the other 17 miles away. It would be like driving at high speed through a forest. Kind of like the aircar chase in the that Star Wars episode, except the road would be straight and not too many vehicles would disintegrate due to driver ineptitude, like the bad guys did chasing Luke Skywalker. But I know building the highway through the trees would never have happened, liability considerations would have dictated that even if the forests were still there, the trees near the highway would have been cut down so as to prevent their falling on the roadway during storms, etc. We pay for insurance in more ways than money; it is always so. But no, we see the big, dark stumps now. All these trees have been recycled (or is that “cycled”) to houses and railroad ties and paneling for the original station wagons and whatever else cheap, durable, beautiful lumber was used for back then. The stumps do serve a purpose. Seeing them, and reflecting on the big trees and the loss of them are the reasons I try to conserve the old wood whenever I get a chance to obtain some. Friends have been generous to me by letting me have the cypress that would otherwise have ended in a burn pile at the demolition/recovery site of a house, barn or other. It always surprises me to see how much wood isn’t considered reusable because it has a ragged end, or is partially split. I take it all and try to do things with it that allow the wood to continue to be seen and used. Which brings us to the reason for the title of this posting (philosophical introductions are usually long-winded, at least mine are). A few years ago, Gene Seneca, of Grosse Tete, called and told me to come and get some wood that wasn’t considered useful for construction. 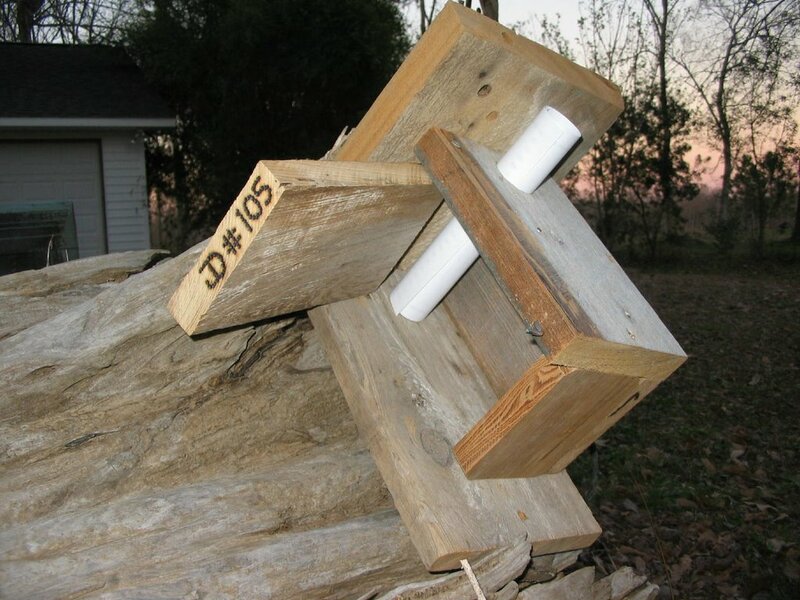 I did, and after pulling all the nails, and squaring the ends, I stacked it and thought how I might use it. The idea of birdhouses came to mind. The wood is rough, looks outdoorsy, is very durable, and birdhouses match my limited woodworking skills and tools pretty well. I began making them and numbering each on with a burning tool. A certificate telling the story of the wood came next and is included with each birdhouse. 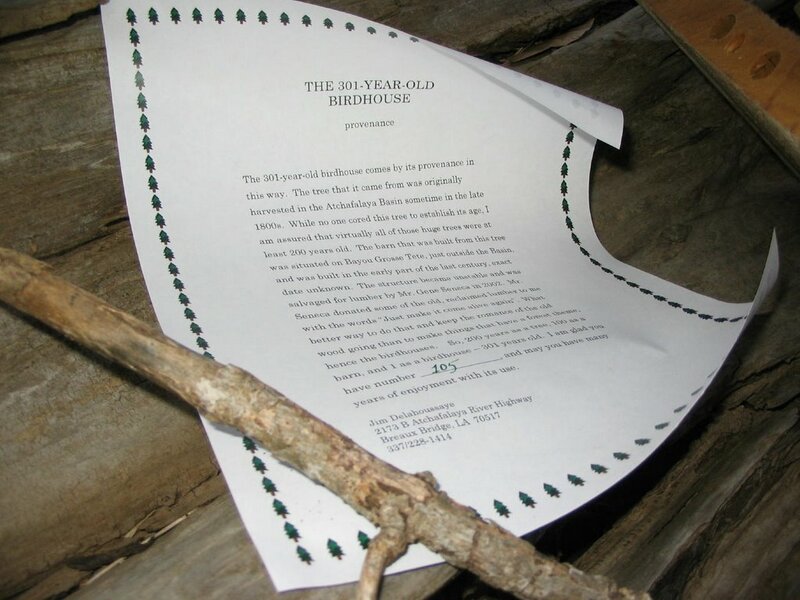 I call them the “301 year-old birdhouses”, for reasons explained on the certificate. I have now made 1 12 of the little wooden boxes, and each has been given away to someone who values the old wood and has a place in the yard for this artificial cavity for titmice, chickadees or bluebirds to use. I have 11 of them in our yard and they are used every year by bluebirds, chickadees and prothonotary warblers. The latter are common in our woods because we live next to this big river. Some of the boxes have been shipped to Idaho, and others now live in Florida and Indiana and Texas. I don’t know what uses them in those places, but I’ll bet something does. Anyone knowing about scrap cypress that is available for a good cause? Let me know by email (in my profile in Blogger.com) or by comment to this posting. Thanks. The river is at 2.6 feet on the Butte La Rose gauge, going to 2.1 by Saturday. The Ohio and Mississippi are a little up and a little down, as is normal for this time of year, more or less, maybe.